V&A Museum of Design Dundee will be the first ever dedicated design museum in Scotland and the only other V&A museum anywhere in the world outside London. Following an international competition that received over 120 entries, Japanese architects Kengo Kuma & associates – who are also designing the Tokyo 2020 Olympic stadium – were given the go ahead to implement their outstanding design in Dundee. Opening in 2018, the museum is set to welcome up to 350,000 visitors every year, who will be able to access exhibition galleries focusing on historical and important objects from the V&A and collections across Scotland. Building flythrough of V&A Dundee from V&A Dundee on Vimeo. 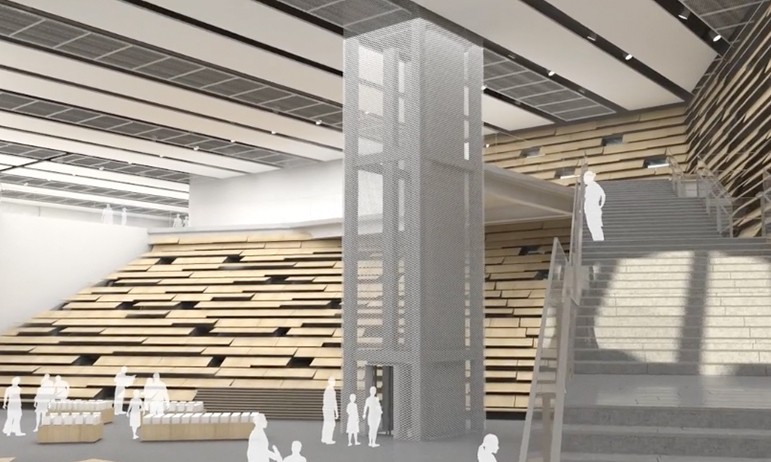 View the video by Edinburgh-based Luma3Di, which offers a fly through visualization of the new museum and shows where expanded metal mesh will be used in the interior. V&A Dundee will also host international touring exhibitions, making Dundee an international centre of design and the only location in the UK outside London to receive these globally significant exhibitions. The Expanded Metal Company supplied a range of expanded metal mesh products to a leading contractor on the project: these are being used in the construction of several striking interior features at V&A Museum of Design Dundee. Expanded metal mesh products are being used in the construction of several striking interior features at V&A Museum of Design Dundee. We work alongside architects, designers and developers to create bespoke solutions for their projects – drawing on our manufacturing capabilities and deep knowledge of expanded metal mesh, we can help to shape the interiors and exteriors of buildings.